What it is: “Onychomycosis” (or toenail fungus) is an infection beneath the surface of the nail caused by a certain type of fungus — usually a dermatophyte or a mold. Where it comes from: Most people pick up nail fungus around public pools, showers, locker rooms, or other damp spaces. The fungus can also be found in soil or professional spa foot baths. What it looks like: Mild cases may look like raised white patches of eczema on the nail. More advanced toenail fungus thickens the nail and turns it yellow. The nail may begin to crumble like chalk along the edges. It usually starts on the big toe, but spreads to the smaller ones if left untreated. Looking at pictures of toenail fungus in various stages may help you understand the different appearances the condition may take on. What it feels like: Most people don’t feel any physical symptoms associated with their toenail fungus, but it can end up feeling tender on the toes. The most common feelings are the emotional one, such as embarrassment and depression. Why you should treat it: Tiny fungal spores take hold in dark, damp environments (like your shoes) and reproduce at a rapid rate. If there is a pushed-back cuticle or other cut on the foot, the fungi can get inside the body, causing cellulitis or osteomyelitis infections. These secondary infections are a particular concern for people with diabetes. For some sufferers, severe toenail fungus infections may cause pain and discomfort when walking or wearing shoes. Sometimes the nail turns black, separates from the nail-bed, and falls off. Most of all, it’s just plain unsightly! How it’s treated: The mildest cases of toenail fungus may respond to a home treatment, like 100% pure tea tree oil. You can also buy over-the-counter nail lacquers, but be aware that these treatments may not penetrate the nail-bed to reach the root of the infection. The most common treatment is a three-month course of doctor-prescribed Lamisil (terbinafine), a once-daily oral drug. However, not everyone responds to this treatment and oral medication can be hard on the liver, so it’s not right for every patient. Lastly, there are newer laser toenail fungus removal treatments, but they are expensive (as much as $1,000 per session) and not covered by insurance. When it goes away: Unfortunately, you have to wait for the afflicted fungus nails to grow out, which could take six to 12 months. In the meantime, there are some cosmetic tricks you can use to make the nail look a little more aesthetically pleasing while you wait. The good news: It’s usually not dangerous or life-threatening. Unfortunately, many people who undergo treatment for toenail fungus end up with a chronic disease. No matter how many different treatments they try or how often they treat it, the fungus keeps coming back. “I’ve been dealing with toenail fungus for nearly 10 years,” writes one person in an online forum. “The sad thing is: I am only 25. It got so bad, nearly all my toes were fungus-ridden.” She says her doctor started her on a course of generic Lamisil, which seemed to work, but she was unable to continue treatment when she unexpectedly became pregnant. “Now here I am 25 weeks pregnant, and the nail fungus is coming back in four of my toes,” she said. That’s enough to make any sane person crazy! 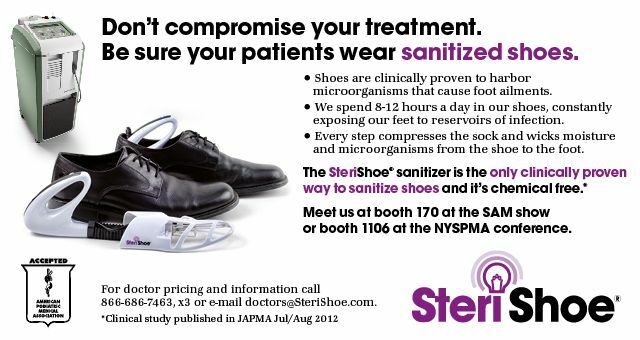 Doctors recommend using SteriShoe UV shoe sanitizers to clean footwear of fungal spores. Not completing the prescribed course of treatment from start to finish is one reason people get nail fungus again. Another one of the main causes of toenail fungus recurrence is that people tend to put their treated feet right back into fungus-laden shoes. The SteriShoe UV shoe sanitizer works by using clinically-proven ultraviolet rays to zap up to 99.9% of all fungi, bacteria, and viruses dwelling in footwear within one 45-minute treatment. Try one risk-free for 30 days, with a full money-back guarantee. Stay tuned for future segments on athlete’s foot & stinky, sweaty feet!